Start analysing the NAB Challenge data to see who should make your fantasy team thanks to DT Live. You may have noticed the banner on the front page of the desktop version of the site that directs you to live fantasy scores each week. DT Live is Chad Leverington‘s baby and for the last couple of years he has been building a fantastic resource for fans of all versions of AFL Fantasy. Click here to access the site. 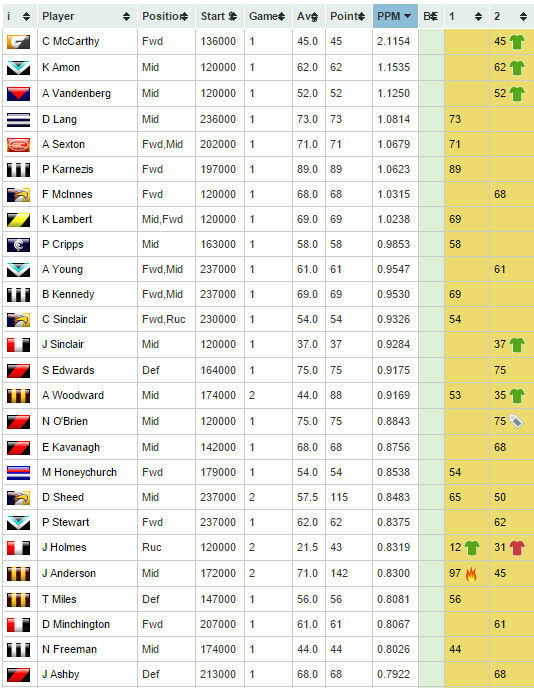 While we are waiting for the pre-season staple that is the Fantasy Freako newsletter (click here to sign up), Chad has set up Data View after capturing the fantasy scores and other important stats such as time on ground over the first two weekends of the NAB Challenge. Click here to access Data View. Data View is a very powerful tool. 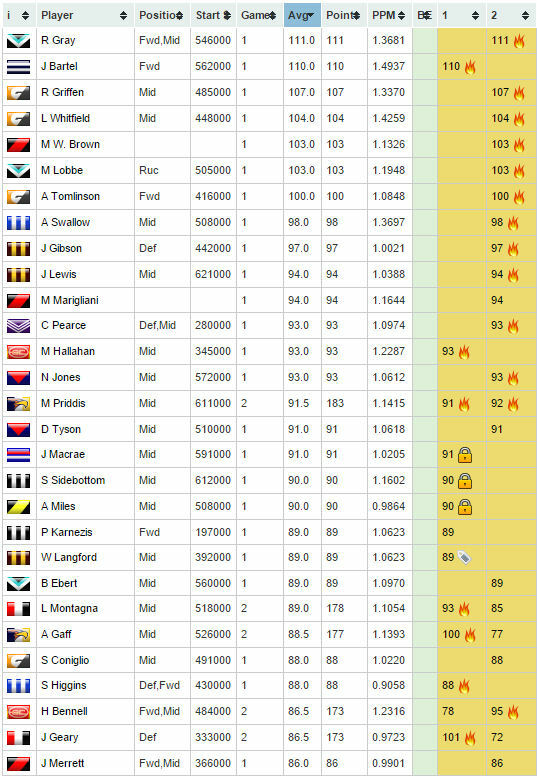 Using official fantasy prices, positions and stats from the NAB Challenge, you can filter your searches to your hearts content; by price, position and more. Have a play and see what you can find. These stats will continue to be updated throughout the pre-season and Data View will return once the season has started to help you make the best choices for your fantasy teams. So, looking at the first two weekends, here are some notes. Matthew Priddis (MID $611,000) is the highest averaging player to play two games with 91.5. He is followed by Leigh Montagna (MID $518,000) with 89, Andrew Gaff (MID $526,000) with 88.5, Harley Bennell (FWD/MID $484,000) with 86.5, Jarryn Geary (DEF $333,000) with 86.5 and Jack Newnes (DEF/MID $464,00) with 83.5 points per game. Although he’s played minimal game time – and shouldn’t really count here – GWS’s Cam McCarthy (FWD $136,000) is scoring at 2.12 points per minute. The next best include Nathan Hrovat (FWD $405,000) at 1.53 ppm, Jimmy Bartel (FWD $562,000) at 1.49 ppm and Lachie Whitfield (MID $448,000) at 1.43 ppm. These guys had played just one game each. The best points per minute for guys who had played in two NAB games were Harley Bennell (FWD/MID $484,000) who went at 1.23 ppm, Calvin’s boy Jack Steven (MID $$491,000) at 1.18 ppm and Eagles Matt Priddis (MID $611,000) and Andrew Gaff (MID $526,000) who went at 1.14 ppm each. 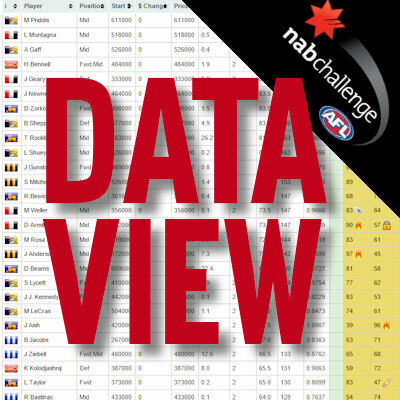 Data View – NAB Challenge Points Per Minute (first two weeks). As mentioned, you can filter by price. I’ve looked at the best under $250K so far as that’s where we need to try to fill our bench spots and last couple of places on our fields. Behind McCarthy, Karl Amon (MID $120,000) with 1.15 ppm and Aaron Vandenberg (MID $120,000) at 1.13 ppm looked the goods in their short time out on the ground in their solitary games. Alex Woodward (MID $174,000) is the best of the guys who have played two games averaging 0.92 points per minute. There’s so much more that DT Live does, you just need to have a play! Sign up and create a profile. Chat with other fantasy fans during while watching the live scores over the NAB Challenge and then throughout the season. Feel free to post ideas you have for Chad – and any other great stats you find while playing – in the comments. Thanks Warnie. Im personally not starting with Priddis but i think he is an underrated option having only missed 3 games in the last 4 years and his lowest average in those last 4 years being 94 thanks to a head knock, he imo will be a top 8 scorer at the end of the year, maybe top 8 averager maybe not but his consistency and durability is second to none. And you only have to look at those nab figures to see. What does the silver thing next to Nick O’brien’s score mean? I was just wondering whether you guys are putting together a team for this year for the price of a pint? I’m waiting for the elusive team so I don’t waste my time doing my own crappy research!!! haha! 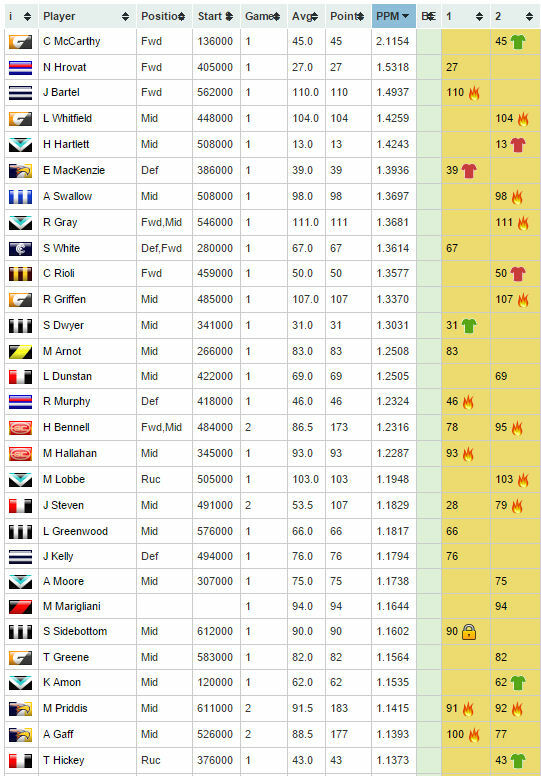 Just a question the Ownership numbers, are they ownership numbers of players in my team section of the DT Live site or true ownership percentages of peoples current teams in either AFL or RDT? I think they are from DTL from the Drawing Board. I don’t think Chad can get them out of AFL Fantasy as yet… probably after rd 1 he can.